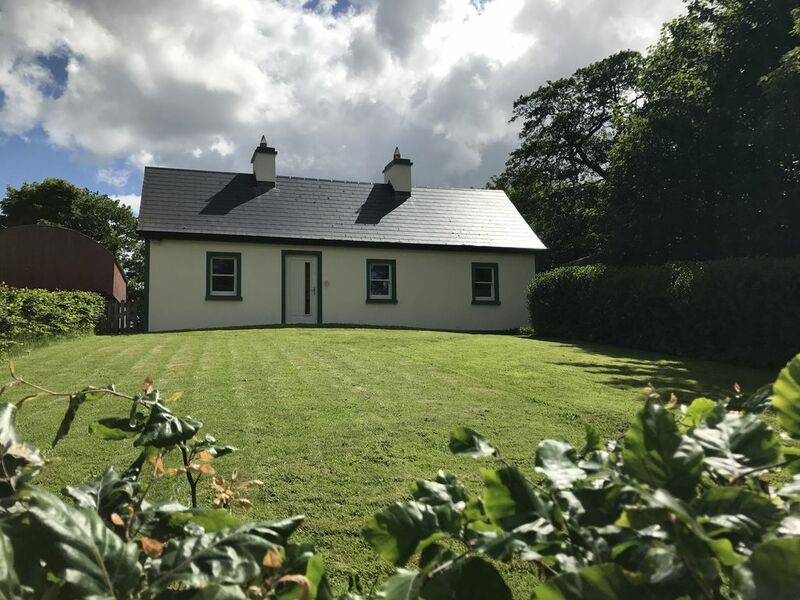 Built by the Congested District Board in 1903, this beautiful cottage has just been completely renovated and has a 4* rating with the Irish Tourist Authority. Situated in the small village of Bracklagh, it has been finished to a very high standard with a new bathroom and kitchen, ensuite wet room, wood/peat burning stove, sky+HD, Ipod docking station, digital Roberts radio, linen from The White Company, towelling robes and underfloor heating via a groundwater heat pump. A refurbished hay barn is ideal for parking, while a second, lockable barn is ideal to store bikes, surfboards and the like. Bracklagh is very quiet and a haven for wildlife – particularly hares. I moved back to Mayo in 2000 after 10 years of renovating my family home - it took so long because of time and budget constraints. My wife, Suzi, came too and we were joined in December by our daughter, Muirgheal. The family has now grown to include a donkey, 2 alpacas, 4 dogs (2 large, 1 small and 1 medium), 2 shetland ponies, 1 cat, 3 terrapins and a good few fish. Tigh Mhic is less than 3 miles from home which makes it easy to be on hand to help our visitors and for them to come and visit our menagerie. In 2003 the renovation bug took hold again. A little quicker this time and Mick's Place is now a fully restored cottage. It is in such a peaceful setting we have taken ourselves off there for our own holidays! Our joys are gentle walks, occasional cycle rides, sitting with a good book and a glass of wine and spotting nature. These interests are definitely well served at Mick's Place. We also love the fact that you look up whenever a car or tractor goes by as traffic is an unusual sight. Ensuite wet room with shower, sink and wc. Large bathroom with bath/shower head, wc, sink. 12 place settings provided plus a wide range of food preparation/serving dishes and utensils including blender, weighing scales, 5 piece pan set and wok. Cooker, hob, fridge/freezer, separate freezer, microwave, dishwasher, toaster/sandwich toaster. Tigh Mhic has a wooden garage and cars, wooden farm set, lego, nintendo ds and games, dolls and cuddly toys which all love to be played with. Both Ballyhaunis and Claremorris golf clubs are just ten minutes from Mick’s Place. Ballyhaunis is a nine-hole course with the tees placed at different positions for the front and back nine. Claremorris is an 18-hole course created by the same designer as the world famous Druids Glen course in County Wicklow. Mick's Place is all on one level and with the ensuite wet room is ideal for anyone who struggles getting into a bath. Notes on accommodation: Secure front garden ideal for youngsters. Small slide and paddling pool and selection of both outdoor and indoor toys available on request. The fields and barns are great for exploring, while our quiet road is ideal for young cyclists and walkers. Pancóg and Timmy, our miniature shetland ponies live in the field next to the cottage and are always happy for a little attention. Outside: Front and rear lawns plus a half-acre field, several barns, patio area and hard landscape for sitting out. Benches and garden furniture are provided. Bicycles available for hire. Utility Room: Washing machine, ironing board and iron. Cleaning / Towels / Linen / Maid service: Towels, bathrobes and linen included. Beach towels available on request. Daily maid service available at extra cost. Other: Dining table and six chairs provided in the kitchen area. Last week was our third time staying in this beautiful cottage. We have already booked our next stay. The house is decorated beautifully and really cosy. The two ponies are a massive hit with our children. Sean and Suzi are a pleasure to deal with. Would happily recommend this cottage. Love it! Sean and Suzi were exemplary hosts. You won't find better. We loved our time in this quaint cottage and would go back in a heartbeat. Thanks so much. I had such an amazing short stay here. This house is set in picturesque countryside and has obviously been lovingly restored. Everything from the underfloor heating to the comfy bed and linen made my stay here thoroughly enjoyable. Highly recommend this beautiful cottage, especially if you're looking for some peace and quiet. I would definitely be looking to return. Glad you enjoyed it and hope to see you again soon. The ponies were delighted with you, too, as the standard of their feeding seemed to be better than we achieve! Sean & Suzi were a delight! We loved the cottage, it's cozy, nicely decorated, has all the appliances, dishes, utensils, etc. that one could ask for during a week-long visit. We especially liked the underfloor heating - makes the cooler evenings so much more enjoyable! Thank you for making our Irish holiday one to remember! Always welcome: wish we had underfloor heating in the home place! Next time ye will have to come when the heat pump is measuring 32C outdoors in an Irish heatwave! Kilviners always welcome! Hope the wedding went well. The ponies gave a good report back, but expect more carrots on your next visit! A nicely restored house in the middle of nowhere. Owners Sean and Suzi couldn't be more welcoming. House is much more than a 'holiday home', it's nicely furnished with lots of little extras that make the stay enjoyable. Location is ideal for walking holidays or lazing around, but there are not a lot of tourist attractions in the area so bad weather can limit your options. Leave plenty of time to travel on the roads, so many people want to travel at 70% of the speed limit even on major roads. Thank you for your kind review. We very much want Tigh Mhic to be a home from home so it is lovely to read your thought just that. Wildlife spotting is very popular at Mick's Place, with baby hares - and their parents - putting in regular appearances. Mayo has more Blue Flag beaches than any other county in Ireland. Mick’s place is an hour’s drive to both Ross Strand in Killala and Bertra Beach in Westport. A trip to Achill is highly recommended: it’s two hours to Keem Beach, Keel Beach, Dugort Beach, Golden Strand and Dooega Strand. Straying into County Sligo, Inniscrone Beach – an hour away – is well worth a visit, too. Tulrohaun Post Office and small shop is within 5 km and stocks the basics. The nearest pubs are Flanagan's in Brickens (5 km) which also serves great food Wednesday to Sunday and Ronan's in Bekan (5 km). In Ballyhaunis you will find a range of shops including banks, greengrocers, butchers and supermarkets. Tesco can be found in Claremorris along with a larger selection of shops including a great delicatessen (The Food Store), a new indoor swimming pool, children's indoor play centre, restaurants, pubs and cafes. Booking Notes: €100 non returnable deposit payable on booking with the balance to be paid in full 4 weeks before arrival. If booking within 4 weeks, full payment is required. Bank transfer is our preferred payment method and we will send an invoice for your booking deposit and a second one for the balance. Paypal, Euro and Sterling cheques are also accepted. Changeover Day: Fully flexible arrival day - our only stipulation is a minimum of a two night stay. Notes on prices: Bikes are available for €15 each per stay. Dogs are welcome. Free internet access available (subject to maximum download limit). Home catering service and babysitting available - please ask for details.